A quick look at the upcoming Hyundai Santro's features and specification list and how it fares in comparison to its rivals. The all-new Hyundai Santro is set to launch on 23rd October 2018. While we wait for this highly-anticipated hatchback to launch, let's take a quick look at the features and specifications of the Santro and how it compares to its closest rivals, such as the Maruti Suzuki Celerio and the Tata Tiago. While the new Santro is built around the 'tall boy' design philosophy, it does not seem awkward or ill-proportioned. This is courtesy of the increase in length and width to balance the tall stance. 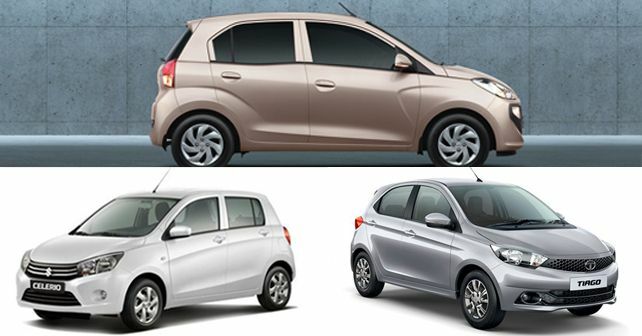 This, along with the fact that the new hatchback is based on Hyundai's K1 platform (same platform as the old i10), indicates that the Santro will feature a roomy and spacious interior with leading figures in terms of space for both the front and rear occupants. Keeping in line with Hyundai's trend of offering a long list of features on their models, the new Santro will also offer quite a few segment-first features. However, expect most of them to be present only on the top-spec Asta trim. Features such as a 7.0-inch touchscreen infotainment system with Android Auto and Apple CarPlay connectivity, rear AC vents and a reverse camera will be seen on the 2018 Hyundai Santro. The touchscreen will also serve as the display for the rear parking camera. To make the owners of the lower-spec variants happy, lower variants are expected to get steering-mounted audio controls (non-touchscreen audio system), power windows, a USB port at the front and power-adjustable and folding ORVMs with integrated turn indicators. The new Santro will also mark Hyundai's debut in the AMT space. The 5-speed, in-house Smart Auto AMT gearbox is expected to be available only on the Magna and Sportz trims, which means it won't feature on the top-spec Asta variant nor the CNG versions. The new Santro will be available in five variants, starting from the base D-Lite and moving on to Era, Magna, Sportz and the top-spec Asta option. Expect the top-spec Santro Asta to come with full wheel covers, since there are no alloy wheels on offer on any variant of the car. For a more premium feel, the Asta variant will get a chrome surround for the grille and the ORVMs (with turn indicators) while the door handles will be body coloured. This variant will also get a rear wash/wipe as standard. While the standard motor on offer will be a 1.1-litre petrol, there will also be a CNG-powered version carrying the same engine with a lower power and torque output than the petrol derivative. The factory-fitted CNG kit will be available in Magna and Sportz trims only. In terms of safety, the model gets dual front airbag, ABS, rear parking sensors, EBD and a speed alert system. While all the mechanical specifications have been tabled below, you can read our first drive review of the new Santro here to know more about the car's driving dynamics.